The smartest, wittiest, most incisive media analysis show in the universe. The weekly one-hour podcast of NPR’s On the Media is your guide to how the media sausage is made. Hosts Brooke Gladstone and Bob Garfield examine threats to free speech and government transparency, criticize media coverage of the week’s big stories, examine new technology, and unravel hidden political narratives in the media. In an age of information overload, OTM helps you dig your way out. The Peabody Award winning show is produced by WNYC Radio. Podcast: On the Media: Summer Listens #9: Pledge This! Each week through Labor Day, we'll be pulling an OTM gem from our vast archives for you to enjoy on the beach, in a park... or on a sticky subway, while imagining you're on a beach. For the last episode of our summer listening series, we present our first and only effort at full-fledged radio theatre: Pledge This! To hear more of our summer listening, don't forget to subscribe to our podcast on iTunes, or wherever you get your podcasts, and leave a review while you're there! 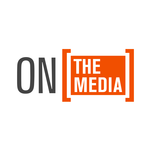 And as always, follow us on twitter @OnTheMedia.